The first thing leading into any situation - especially if you're an animal - is the nose. First thing a fox, a wolf, a dog, an antelope, a cat etc. does on meeting is what? Get the old schnozola out there, right? They start sniffing this and sniffing that upon meeting. Freud had his ideas about the nose too but we won't eeeven go there. Snakes "smell" the air with their tongues and our organ of taste is intricately involved with our ability of to smell. So the nose, evolutionarily speaking, has been our most social sense - or antisocial - depending on how you look at it. In these postmodern/ post-Neanderthal days sight has come to dominate our sensorium and smell has been demoted to a secondary or even a tertiary position in our sensory armamentum. That was a mouthful. Now we'll turn our venerable powers of vision to this fading but still trusty organ of olfaction. What do you need to look for when drawing the nose? Before we get into any actual anatomy of the nose, let's review how it fits into the face. Well, it starts there right between the eyes at the center of the forehead (this is the root of the nose), courses over the plane between the cheekbones and lands at it's base above the upper lip. 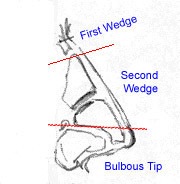 3) The bulbous tip is really the most complicated part of the nose because the tip of the nose, the nostrils, and the septum (the partition between the left and right halves of the nose) are all grouped together here. Can you identify all three sections of each nose in this picture and the one above? middle and bottommost wedge (i.e. the bulbous tip). More than any other feature of the face, the nose has subtle, not so subtle, and sometimes even striking angles and planes jigsawed into it. That's a result of all those cartilages and air spaces fitting together like a piece of complex carpentry. And that can make it tough sometimes to decide what exactly to draw. Again, having a feel for the general wedge shapes will be more than enough to get you started. The Karl Malden, Owen Wilson "two-part tip-of-the-nose"
Just to confuse you more, all you've learned about the caritlages can be doubled. "Doubled!" you say. Yep, doubled. Doubled because the nose has left and right halves: mirror images. In some folks this is very obvious (again, like in Owen Wilson and Karl Malden). Now that's a lot of information I just threw at you. 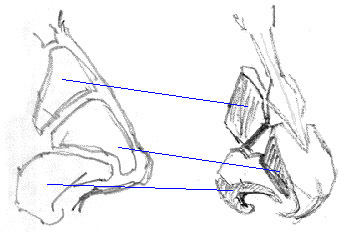 But when you look at this next picture, can you now see the different divisions of the nose - both in terms of the three wedges and in terms of the cartilage underneath? Can you "see" the cartilages in this next picture? 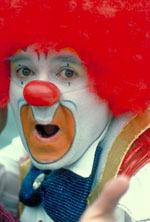 Can you imagine you see the different cartilages beneath the surface of the nose here? Can you see the different wedge shapes within the nose? 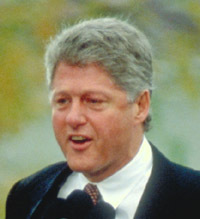 Compare those to the "cartilages"
between the eyes - it's kind of hid behind the glasses. OK, that was pretty in-depth. 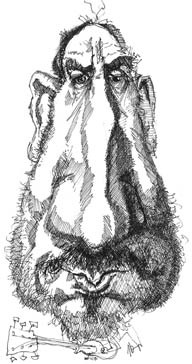 Much more info than you need to know to get started drawing noses, but it will help you recognize a good deal more when observing the nose - especially now that you have an inkling of what's there beyond the surface. If there's something hard to draw about the nose, it's how to make it look like it's attached to the face - without making it look like it's just floating there in space. 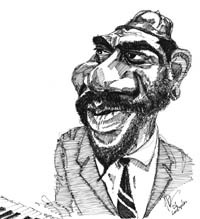 The nose can be drawn in minimalist lines or with a great amount of detail like you see in the Thelonius Monk picture above or this Pete Townsend picture here to the right. Squint your eyes and see if you can't make all the apparent detail collapse into more identifiable and therefore more manageable and drawable shadow shapes. Note the different tones and grades (or shades) of shadows that coalesce when you do that. To resolve number one, shadows, not lines make that transition real. Resolving number the second and third obstacles: heightening your observational skills, learning to differentiate shades and tones of intensity between those shadows, reckoning perspective and proportion. These are the keys to really mastering the rest. I know that's a pretty tall order (but not really - you can learn all that in lessons one through nine of the YouCanDraw.com e-book.) For now, learning to recognize the major areas of shadow will be a great first step. 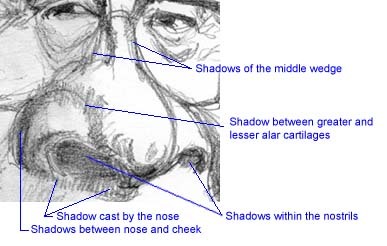 the next darkest shadows are usually in the area where the nose casts it's shadow over the "apron of the upper lip" - which is the area directly between the nose and upper lip. Generally it's a cast shadow. Pointing out the strongest cast shadows of the nose. How to do this? pictures, remember, the shadows will tell you! 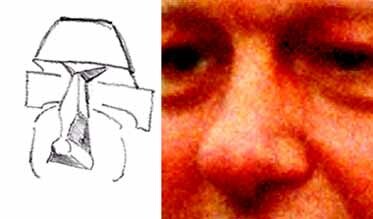 Note the shape of the shadows within the nostrils - remember to squint. And as you squint note how the shapes become more decipherable. Also note how much nostril you see. For instance, look at Thelonius' nostrils compared to the Dali lama above. 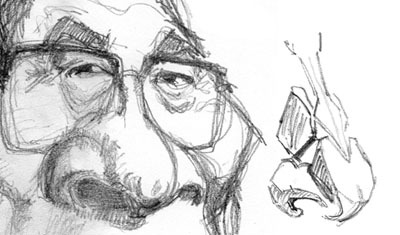 Look how turned up the Dali Lama's nostrils are. One last high-detail drawing. Can you identify the different shadows here? How about highlights? Can you find the main cast shadow of the nose? (it's coursing off to the right side of the picture under the nostril on the right and all the way down over the upper lip). Now ask yourself this: "where's the light source?" direction is the light coming? In this next picture - composed of three caricatures - I want you to compare the noses. 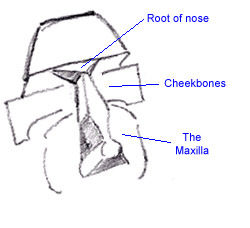 Go down your list of freshly learned "features of the nose" list and identify them in each of the following pictures. Can you identify the major areas of shadowing and highlight? Now go through each of the three sections of the nose on each and with the tip of a sharp pen or pencil outline the actual drawn lines and outlines of each shape of the nose (as if you were tracing them) right on your computer screen. Make your way around this picture and study the different shapes, shadows, highlights and anatomy of each caricature's nose. Go for it! Like you just did with the more complicated pictures, zoom in on each cartoon nose. 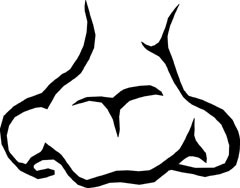 Note how with a minimum of lines your brain gets the message: it's a nose. Try to identify the three wedges within each (if you can only see one or two, ask which: bulbous tip, middle or upper wedge at the root of the nose (where it comes out of the forehead). 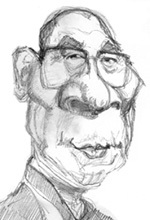 Check out these Nixon "cartoons": (you may have to scroll down the page to find President Nixon - or faster yet, type "Richard Nixon" in the search box at the top right of the page when you get there). 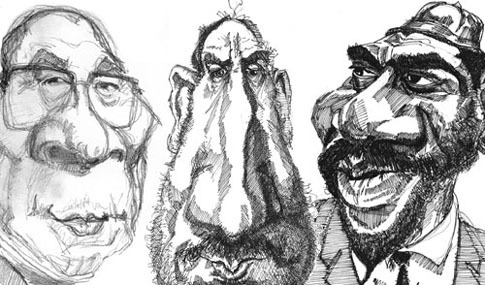 Compare them to these amazingly detailed and in-depth caricature of David Levine's . 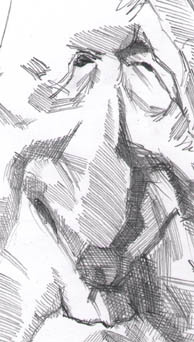 Compare the use of line and crosshatching as well as the overall likeness of the drawings. And you get to draw them in a grid like you've done before. Nothing new here :-) (See how things are starting to get repetitious? Same approaches, just different subjects? That's because there's only five skills you have to learn to learn to draw!) After you draw these, then you get to draw some higher detail drawings. 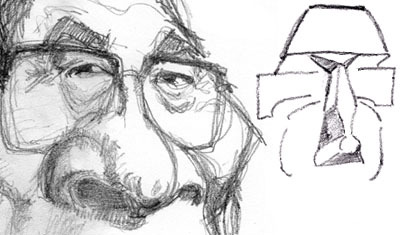 And of you're liking these lessons, make sure you visit the YouCanDraw.com homepage where you'll find arguably the largest book ever written on drawing - it shows you how to draw faces and caricatures in 15 steps - even if you've never drawn before.